I love to photograph people who are great at something in a way that visually illustrates that skill, so when I came across Rhiannon, formerly a player for QPR, currently studying in the USA on a football scholorship, I knew I wanted to shoot a great set of portraits of her, showing her in the act of playing football. Rather than taking the more obvious route of shooting her out on a football field, I though it would be more interesting to bring a little piece of the pitch into the studio and shoot her on that, a little like an action figure on a base, or a statue on a plinth. The first stage was to work up my intial back-of-an-envelope sketch into something more substantial, and plan the lighting. I then needed my circle of grass. 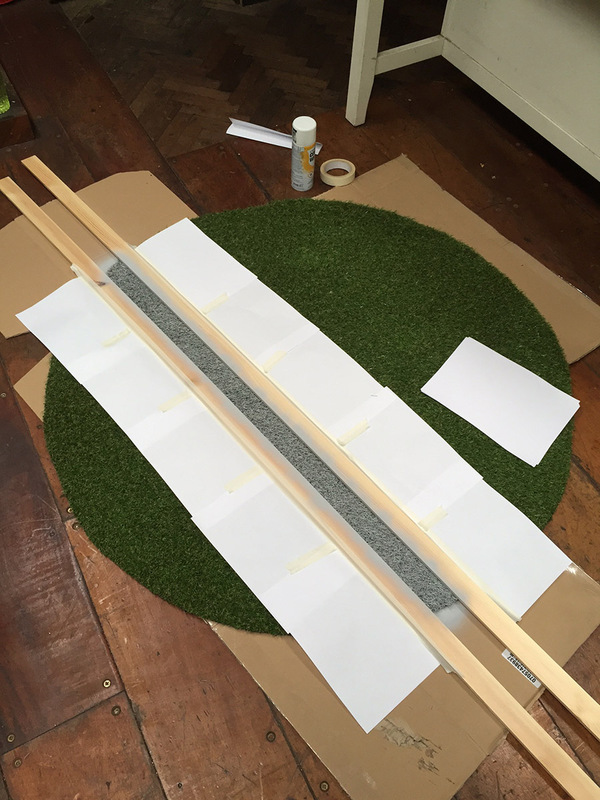 I initally planned on using real turf, but as it is heavy, dirty and difficult to transport and deal with I was pleased to find that you can buy extrememly realistic fake turf, on a carpet-like backing. I cut a circle from this, and masked and sprayed a white line to further create the feel of a football pitch. Once in the studio, I placed a large softbox above Rhiannon as a top light, along with a strip softbox behind on one side and hard light on the other acting as keylights, and a beauty dish as the main front light with another strip softbox as a fill. A 12' x 12' black cloth backdrop was hung up in front of the set for Rhiannon to boot the ball into, as I wanted her to be able to really commit to her kicks without worrying about destroying the studio. I also shot empty plates of the white studio cove, with different spot light effects on the back wall, as I knew I would be replacing the background of the shots. Creating a background plate for real rather than purely digitally gave it a sense of reality, an idealised studio setting rather than a very flat CGI feel. As i had the studio and lighting all set up I was keen to shoot a second subject as well if possible, and Lorna kindly agreed to do some skateboarding for me so that i could treat it in the same way and create a little circle of skatepark in the studio that she would be skating on. She made loads of great shapes doing ollies and bomb drops and I picked my favourite pose to use as the final image. I also made sure, in the next day or so, to shoot the floor of a local skatepark and some local roadworks, which had revealed a cross section edge of concrete. But when I used the assets I had shot to create the base for Lorna skating I loved the thickness of the base that it created, as if I had literally cut a section out of the ground and taken it into the studio. So I called in a favour and cut some pieces of turf out of the ground so that I could shoot a cross section of the earth beneath the grass. I could then use this to give the fake turf from the studio shots some thickness, giving a much better final effect. I'm really pleased with the final images. I love freezing fast motion, I love shooting people who have skills and showing those in an interesting visual way, and I'm really pleased I found an interesting and unusual way to photograph Rhiannon and show her as an athlete, and could then expand that to show Lorna as well. I'm looking forward to continuing the 'circle' series with other sports.